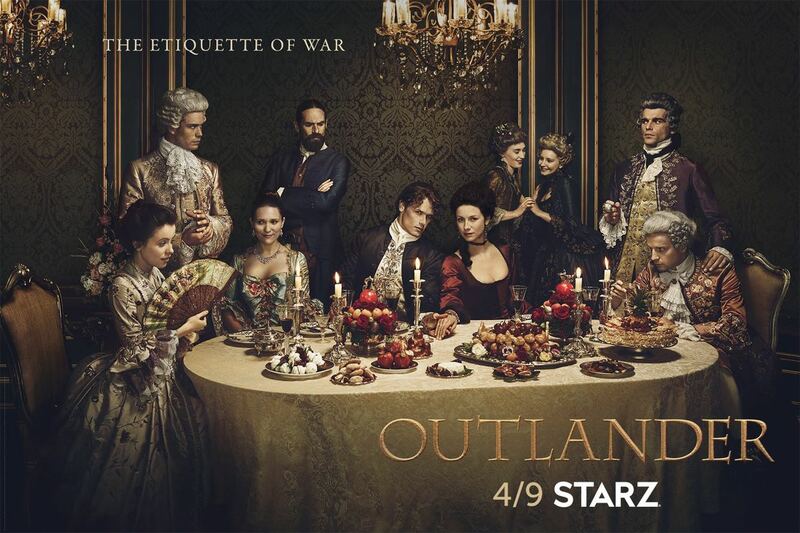 Starz released new key art today for the highly-anticipated second installment of the Golden Globe(R)-nominated STARZ Original series “Outlander” with the tagline, “The Etiquette of War.” Adapted from Diana Gabaldon’s international best-selling books and executive produced by Ronald D. Moore (“Battlestar Galactica,” “Star Trek: Deep Space Nine,” “Star Trek: The Next Generation”), the second installment of “Outlander” returns on Saturday, April 9th at 9PMET/PT. The world of “Outlander” is incredibly different from book one and the new key art celebrates those differences. Whereas the first installment’s art was set on a hillside of the rugged Scottish highlands, this new art invites us in to the opulence and intrigue of 18th century Parisian society. The key art depicts Claire (Caitriona Balfe) and Jamie (Sam Heughan) surrounded by (left to right) Mary Hawkins (Rosie Day); King Louis XV (Lionel Lingelser); Louise de Rohan (Claire Sermonne); Murtagh (Duncan Lacroix); Le Comte St Germain (Stanley Weber) and Prince Charles Stuart (Andrew Gower). Claire and Jamie are attempting to change history, by stopping the battle of Culloden, through flattery, manipulation and politics. The Frasers are fighting this war – not on the battlefield – but in the courts of King Louis. While the original image was about Claire and Jamie being thrown together, this new art shows them united in their mission, fighting for their future together and the fate of Scotland itself. The second installment of “Outlander” begins as Claire and Jamie arrive in France, hell-bent on infiltrating the Jacobite rebellion led by Prince Charles Stuart, and stopping the battle of Culloden. With the help of his cousin Jared, a local wine merchant, Jamie and Claire are thrown into the lavish world of French society, where intrigue and parties are abundant, but political gain proves far less fruitful. Altering the course of history presents challenges that begin to weigh on the very fabric of their relationship. However, armed with the knowledge of what lies ahead, Claire and Jamie must race to prevent a doomed Highland uprising and the extinction of Scottish life as they know it. 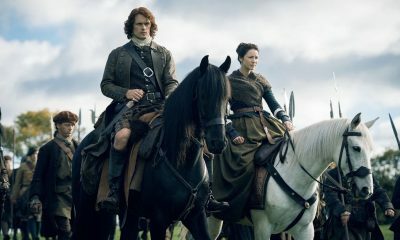 The13-episode series is based on the second of eight books in Diana Gabaldon’s international best-selling Outlander series, entitled Dragonfly in Amber. 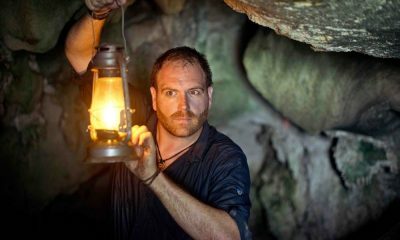 Gabaldon’s Outlander series has sold more than 26 million copies worldwide and all eight books in the series have graced the New York Times best-sellers list. Ronald D. Moore, Jim Kohlberg, Andy Harries, Maril Davis, Ira Steven Behr, Toni Graphia and Anne Kenney serve as executive producers of “Outlander,” which is produced by Tall Ship Productions, Story Mining & Supply Company and Left Bank Pictures in association with Sony Pictures Television. For more information, go to the official Outlander Facebook Page and follow @Outlander_Starz on Twitter and Instagram. Join the conversation with #Outlander and #STARZ.